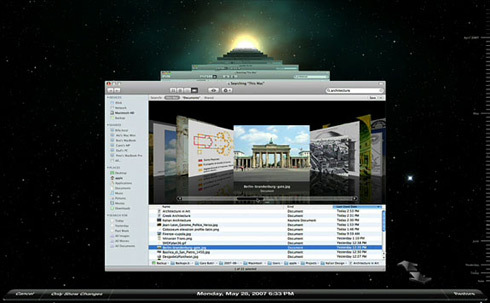 Time Machine throws out your typical operating system user interface (UI) out of the window and places on the table something completely different, something that has over-exaggerated visuals, something that’s simple to use, something that’s just a lot of fun. When you activate Time Machine, the desktop slides out and you can see stars and the universe, going back in time right to the beginning of it all. This may sound ridiculous, but the concept actually works well. The file browser window remains, but is replicated backwards in time—you can literally see many instances of the window going back. You can then use the simple time navigation controls on the right, or the little arrows to flick back and forth to find what you’re looking for. 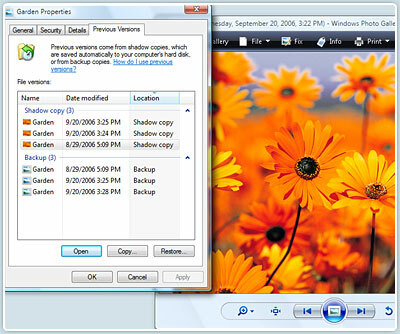 This doesn’t just work with the file browser, it also works with things like Address Book contacts and your email. Activating Time Machine is also fairly easy—just plug in an external hard drive, go to the Time Machine preferences and flick on the huge “ON” switch. That’s it, you’re done. This may sound a little simplistic to power users, who may laugh at all the eye candy and say that this is just typical Apple—making pretty interfaces without actually revolutionizing the actual functions. They’re wrong—the key here is in the UI, and let me tell you why. Hardly anyone uses automated back-up systems—that is, if they even back up. I believe I’ve seen statistics showing that only about 15% of people back-up their data. Why is this? The answer is because it’s too fiddly. It’s not fluid and simple enough a process that you can do regularly. People don’t want to learn new systems. People don’t want to open the manual and read about how they can back-up their data, and more importantly, how they can retrieve it. Most of us just can’t be bothered with this. This is why Time Machine really works. It solves the problem of bother—you don’t have to do anything to use Time Machine. Once you flick the ON switch, everything will be backed up. You can of course tweak some more settings if you prefer, but you don’t have to. Getting stuff back is as simple as going back in time visually—once you see the interface, you will instantly know how to use it. Time Machine’s selling point is the UI—the simplicity and ingenuity of the UI is what makes the application work in this case, and not its feature list. Complicated user interfaces, and I use the term complicated loosely, indeed, anything that isn’t dead simple can become a barrier to use. People just don’t want to use things which aren’t straight forward—they don’t understand them and they can’t be bothered to learn them. A well designed UI is not just there to look pretty—it’s there to remove this usability barrier. Once the barrier is low enough, people will want to use the application, simply because they can use it straight away. I’ve never used automated back-up systems—I used to do it manually. Until now that is. I’m using Time Machine right now. I don’t have to think about it, it’s on and it’s constantly looking after my data. When I need to get my files back, I can get it in a simple and fun way. After all—we don’t constantly need stuff recovered, and when we do, the experience may as well be pleasant.